Made in Japan and crafted from ceramic, this sake serving set comes with a sake jug and two matching sake cups and is in a delicious matcha green. Distinctive contemporary lines give this set a unique stylish appeal. Serve and enjoy your favorite Japanese sake in style. Whether you like your sake chilled or warmed this sake set is a great trendy way for enjoyment. Perfect for drinking chilled sake on summer nights, this matcha green sake serving set is just as seasonal with its smooth matt surface during winter months and fluid white lines reminiscent of snow. 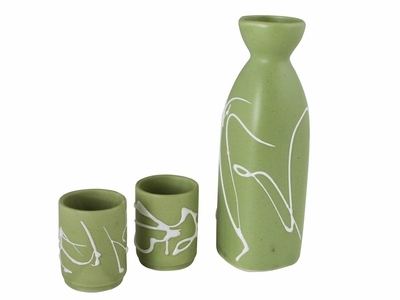 Enjoy fine sake and good company with this stylish contemporary sake serving set. Packaged in a paper box, this sake set makes an excellent gift for sake lovers. Hand washing is recommended for this item.